Today we sailed 4 eliminations. In the morning the wind was light and I decided to sail on the 7,7 Code Red and Isonic 101 with a Vector Canfire 38. The gear worked great, but I started to far pinmark. The distance to the first mark was a bit longer than starting at the boat on the upwind side of the line. I finished both classic 4 mark slaloms ok, but could not qualify for the next round. Only top 6 of the first heat advance. But I felt good, especially on my second heta sailong on 6,7 and Isonic 86. 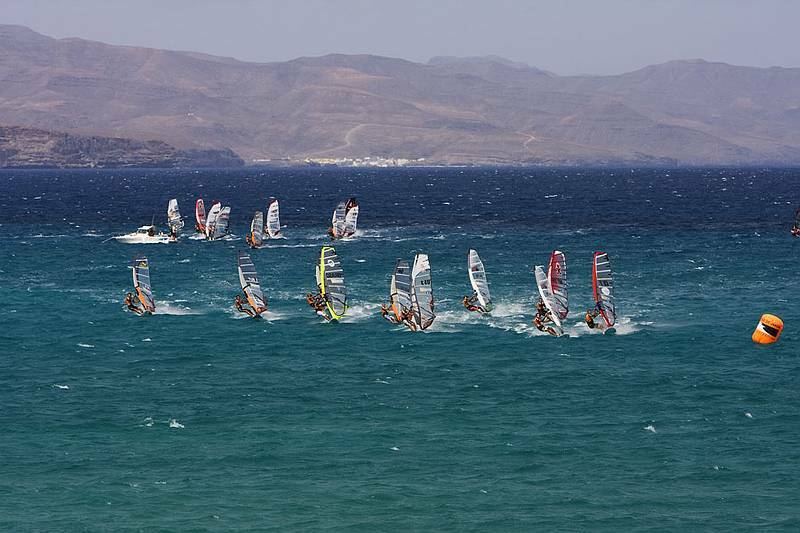 Later on the PWA crew went for 2 longdistance races, which were intense. Sailing downwind for about 2 km and keeping the focus in a 6 six mark slalom. In the first race I crashed twice on the insider marks and lost for sure 10 positions. In the second one I did a bit better and ended up 34th. Both races were not good, but honestly I must write that IÂ´m not used to long distance racing too much. ItÂ´s another discipline and needs a lot of speed. You have to take risk and need massive groundspeed. In the moment I prefer a classic downwind slalom format with six jibe-marks. But more training could change my attitude. Today I lost some ground in the ranking and slipped back to the 35th position. But I will try to keep on going well and hope to come up a bit again. There is a chance that we go for 7 more races. After a race is enough time to go for some fun stuff, in the race you try to keep the board down (shot by KERSTIN REIGER). One of my best first leg in my PWA career so far, which started 2005 here in Sotavento. 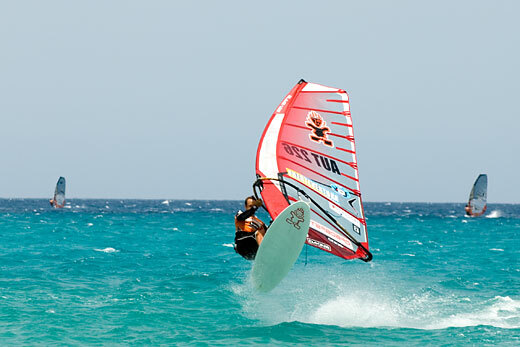 With the red just behind Josh Angulo and Kev (shot by JOHN CARTER / PWA worldtour).